Castelgrande is one of the the three castles in Bellinzona, Switzerland. 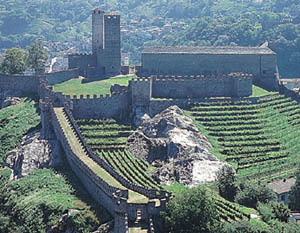 The site of the Castelgrande has been fortified since at least the late 1st Century BC and until the 13th Century it was the only fortification in Bellinzona. 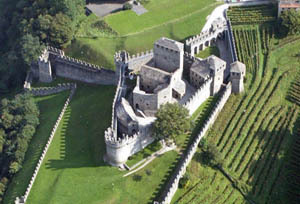 The walls that separate the three baileys all radiate from the 14th Century Terre Nera, which is located in the center of the castle. To the east is a complex of buildings which were part of the old keep in the castle. In the center of the keep is the tallest tower of the Castelgrande, the Torre Bianca or White Tower, which dates from the 13th Century. It was built before 1313 for the pro-Imperial Rusca family, who occupied the castle following the Visconti victory and occupation of the Castelgrande. By the end of the 14th Century it was in the hands of the Visconti. The castle was renovated and expanded between 1462 and 1490 to its current state. In the 19th Century the castle fell into disrepair and was renovated starting in 1903. It now houses a museum, open from March to November. Sasso Corbaro Castle is one of the the three castles in Bellinzona, Switzerland. 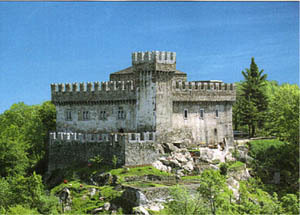 Unlike the other two castles Sasso Corbaro is not integrated into the city walls. The first part of the castle was the north-eastern tower which was built in 1478 to close a gap in the defenses of the city. In 1479 a small garrison was moved to the tower. The north-eastern keep currently has four stories, though no records exist of its original height and roof. It was used as a living area when the castle was occupied.